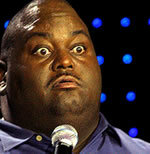 Funnyman LaVell Crawford is quickly climbing the comedic ranks and becoming one rising comedy star to watch. From his numerous television appearances and on stage performances, audiences are becoming increasingly familiar with LaVell's giant sized talent. Lavell has appeared on Comedy Central's Premium Blend and was a Finalist in the Comedy Central Laugh Riots standup competition. LaVell appeared at HBO's US Comedy Arts Festival (Aspen, CO), The Comedy Festival (Las Vegas, NV) and headlined at LAFFAPALOOZA, America's longest running annual urban comedy festival. "Jamie Foxx Presents: Laffapalooza" a series of half-hour laugh-out-loud comedy specials that aired on Showtime and Comedy Central, and subsequently headlined at the Montreal Just for Laughs Festival. Endeared by audiences far and wide, Lavell has built a very strong fan base playing theatres, comedy clubs and colleges across the nation. He has appeared at such comedy clubs as The Improv, The Laugh Factory, Carolines on Broadway, The Stardome and The Comedy House Theatre just to name a few. Lavell has also made the jump to television with comedic appearances on "NBC's Last Comic Standing", "Comic's Unleashed with Byron Allen", "Martin Lawrence Presents 1st Amendment", "Steve Harvey's Big Time," "The Jamie Foxx Show, "Motown Live," "Showtime at the Apollo","BET's ComicView" and "Russell Simmons' Def Comedy Jam,". Lavell has appeared in the films Baby's Mama Drama, Beverlyhood and Ghetto South Problems. On stage, he played Ben in the hit play "Men Cry in the Dark" based on the Michael Basden best seller. LaVell also appeared on stage with the critically acclaimed production Friends and Lovers, a stage production based on the novel by author Eric Jerome Dickey. Crawford played the scene-stealing "Bobby." The play also featured notable actors such as Miguel Nunez (Juwana Man), Leon (The Five Heartbeats), Monica Calhoun (The Best Man), Mel Jackson (Soul Food) and Maia Campbell (In The House). Crawford is one of the most popular up-and-coming comedians in the country. The heavyweight comic champ unleashes his inimitable brand of comedy in his latest CD release. In this instant comedy classic, Crawford takes on topics such as life in heaven, President Obama and a hilarious bit on a Mama’s unconditional love and the universal rules of grocery shopping with her, (“You better not touch nothin’, ask for nothin’, or say nothin’”). July 2011, Crawford appearing in this season of AMC’s Emmy Award-winning dramatic series, “Breaking Bad” will have home viewers laughing out loud in this singular concert film you’re sure to watch again and again. 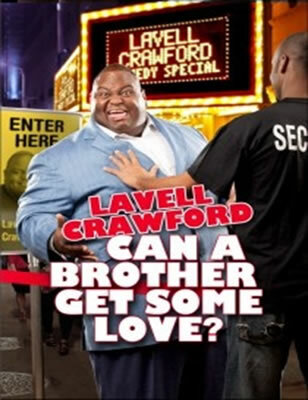 Lavell is currently touring nationally while promoting his own comedy CD titled, "Can A Brother Get Some Love".